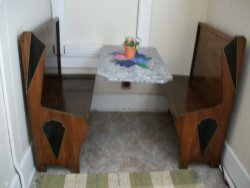 This is a fabulous place to get away and sew, eat, laugh, joke, tell stories and relax all in a cozy atmosphere created by you and your group of special sewing pals. Mothers and daughters might enjoy a weekend or a few weekdays just spending time together. Scrapbookers could spend time working on their hobby. Out of town guests would definitely enjoy the comfortable and charming atmosphere. 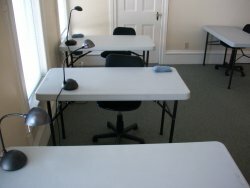 The retreat center is a refurbished apartment that has been organized with quilters in mind. 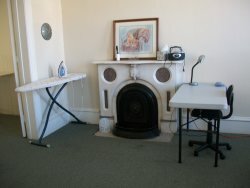 The two front rooms are well lit and have plenty of space for sewing, ironing and cutting out projects. 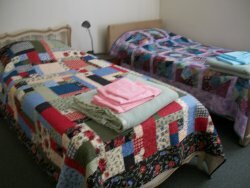 The next three rooms have a total of eight comfortable beds, each with a gorgeous quilt on it. The kitchen and bathroom facility are at the rear of the apartment and are furnished with all the appliances you will need for dining in or you can review a selection of menus and choose to dine out at one of the great establishments in Princeton. For more details or to make your reservation, contact Beth at the shop!